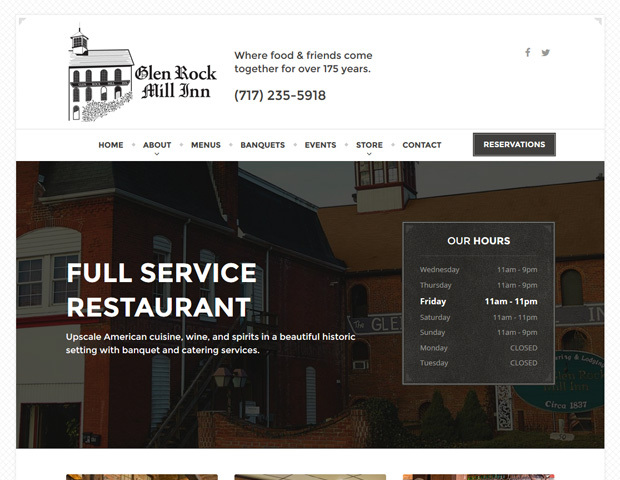 Built in 1837 as a woolen mill, the historic Glen Rock Mill Inn features unique dining areas adorned by rough hewn 14″ beams, original stone and brick work, a spring-fed fountain, and a collection of antiques, many from the 19th century. Our seasonal menu features upscale American regional cuisine with an emphasis on fresh local products. Our menu changes frequently and features unique entrees sure to please the most discriminating diner, time and time again.